The exotic Savannah makes an unusual pet! Savannah cats are extremely unique hybrid cats that are well known for their bright personality, spotted coat, and large size. Find out whether this may be the breed for you. The Savannah cat is marked as a hybrid cat breed because its origins trace back to a cross breeding with the exotic African Serval cat. However, the Savannah is still a newer breed of cat, having originated in the early 1980s at the hand of Bengal breeder Judee Frank. She was the first to cross an African Serval male with a domestic female cat, and the resulting Savannah breed soon became a hit with cat enthusiasts. It wasn't long before Savannah cats became a registered breed with The International Cat Association (TICA). To this day, the Savannah breed continues to be campaigned throughout TICA in an effort to reach Championship status. 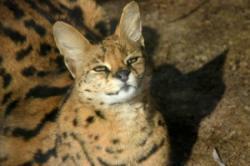 So, why is the descendent of a Serval labeled the "Savannah"? The breed's name is a reference to the African Savannah where the African Servals reside. This breed's name was granted to Savannah cats by the owner of the first Savannah, Suzie Mustacio, who purchased the initial hybrid from Judee Frank. Much like the British Shorthair breed, Savannah cats can grow to be very large in size, even exceeding 20 pounds! Unfortunately the African Serval does not make for an adequate house pet due to its large size and tendency to act like a miniature cheetah. The Serval cat can grow to be as large as 44 pounds, which makes it a difficult pet to maintain. Moreover, the Serval does not have an affinity for acting as a lap cat, whereas the Savannah is much more amicable about being held. Hence, the Savannah, with its cheerful temperament, makes for a far better house pet. Savannah cats are very lean exotic looking felines with long legs and elongated necks as well as large ears. Their heads are relatively small, and breed standard Savannahs have heads resembling equilateral triangles. In fact, heads should be smaller in proportion to these cats' bodies. The Savannah's exterior features a spotted coat with occasional bars. The shorthair coat is typically a gold to tawny color with a markedly lighter underside, although some Savannahs are silver spotted, black or smoke colored. The breed standard Savannah exhibits horizontal bars along the fur on the back of its ears. You can read more about the Savannah breed standard at the official TICA site. Savannah cats are a newer breed, and some of the major cat associations are still shunning this hybrid breed although more breeders are catching on to the beauty of this cat. The Cat Fanciers Association (CFA), for example, is currently doesn't acknowledge the Savannah as an official breed, although more innovative associations such as TICA have made a full effort to acknowledge, show and appreciate the Savannah for its exotic aesthetics. If you are looking for a Savannah breeder, you can run a quick Google search or consult Breedlist.com to find the breeder closest to you. Since the Savannah has only reached "experimental status" with TICA, many breeders prefer to stay with the accepted breeds. Hence, Savannah breeders in the United States are limited in number. Keep in mind that many breeders also prefer not to ship their cats due to the costs and possible trauma incurred during the shipment of young kittens. Do not attempt to purchase a Savannah cat from an unregistered breeder, and do request a contract and proof of pedigree at the time of purchase. Purchasing a cat from a cattery unaffiliated with any cat association will not guarantee you a purebred Savannah. Moreover, unregistered catteries are not bound to any breeding ethics, and you may find yourself supporting watered down blood lines and the mistreatment of animals.